This 4 star hotel with its world renowned look is situated next to the Zaandam train station, where the train will take you to the centre of Amsterdam within 12 minutes. Also, the RAI Congress Centre and Schiphol Airport are easy to reach by train. Inntel Hotels Amsterdam Zaandam has 160 unique hotel rooms, a Wellness Club, free wifi internet and it's own Tourist Information Office. The Zaan region was the world’s first industry area: it’s rich history has been translated in a modern way throughout the hotel. 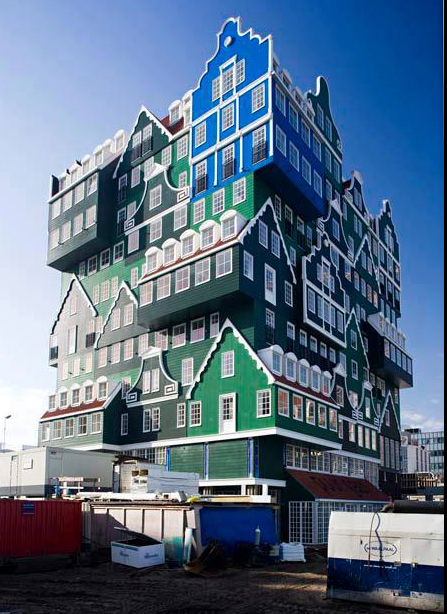 The hotel's green façade is inspired by Zaan houses, while the hotel rooms refer to typical products from the Zaan region, such as mustard, cheese and biscuit. And there's also the Tsar Peter Suite: undoubtedly one of most beautiful suites of the Netherlands! And last, you can really taste the history of the Zaan region in our atmospheric Bar & Restaurant Puur Saen.